The first group of third batch comprising of six MS students including three female , one faculty member and two technical staff of U.S.-Pakistan Center for Advanced Studies in Water (USPCAS-W) at Mehran University of Engineering and Technology (MUET) Jamshoro departed for Summer Entrepreneurship exchange visit at University of Utah and Colorado State University, USA. Before their departure, Prof. Dr. Rasool Bux Mahar, Deputy Director (Academics and Research) had conducted a consultative meeting with them at Conference Room of the Center. In the meeting, Dr. Mahar said that the exchange visit would be very much beneficial for the faculty, students and technical staff to enhance their research skills. “You are the ambassadors of Pakistan and during their exchange visit at USA, you may a great opportunity to project positive image of the country through your study, research and cultural activities”, Dr. Mahar added. He noted that USPCAS-W was established in the generous support by the American People through the United States Agency International Development (USAID). 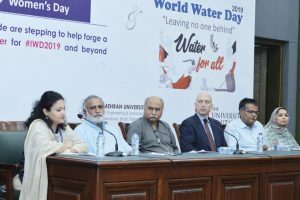 He said that exchange visit is one of the prominent features of the USPCASW – the MUET Water Center, which is also fully funded by USAID Pakistan. He said that the goal of summer exchange program 2018 is to inspire next generation of water entrepreneurs in Pakistan. The program emphasis on to develop business, ventures and technologies to help achieve targets of Sustainable Development Goal (SDG) – 6, clean water and sanitation for all. Dr. Mahar suggested them to involve themselves in academic, research, co-curricular and cultural activities during their stay at the University of Utah and the Colorado State University of USA. He said that the exchange visitors would be facilitated and supported for their respective fields through the mentoring by the professors of the host universities. He further said that apart from the formal course, the exchange program also serves as the great opportunity for networking with other students from different parts of the world. He emphasized on the leaving students to have interaction with American professors for their higher studies like PhD. 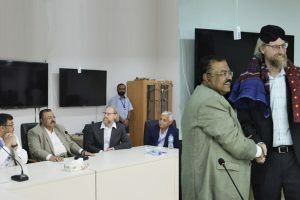 On this occasion, Dr. Mahar also appreciated efforts of Mr. Hamid Ali Shaikh, the newly appointed exchange and scholarship coordinator of the Center for his timely efforts. 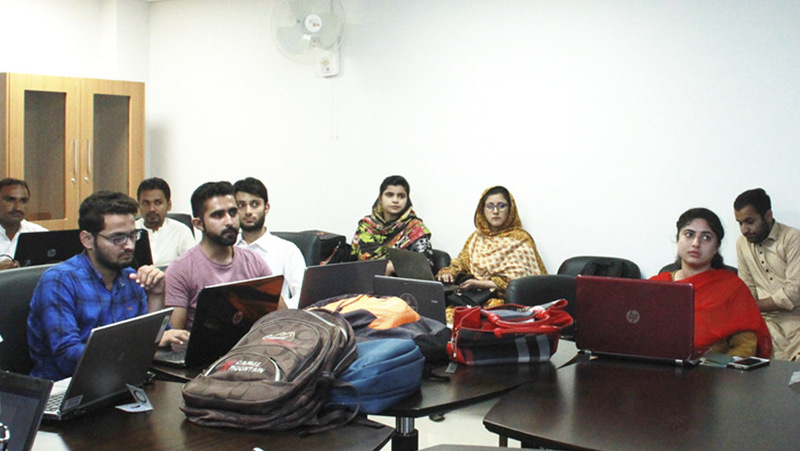 Dr. Tanveer Ahmed Gadhi, Research Associate of USPCAS-W MUET also attended the meeting and advised the exchange visitors for taking necessary precautionary measures for the voyage to USA. During their exchange visit of two and half months, the exchange visitors would attend specific courses and work on their research projects in co-supervision of their respective professors. 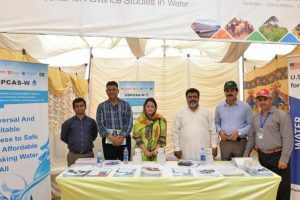 Dr. Muhammad Rizwan, Assistant Professor, Mr. Mehran Khan, Water and Environment Laboratory Technician, MS scholars i.e. Ms. Sorth Ansari, Mr. Aizaz Ali Qureshi, Ms. Sabira Muneer, Mr. Asrlan Mehmood, Mr. Muhammad Shoib Jamro and Marvi Sharma will spend their exchange stay at University of Utah whereas Mr. Muneer Ahmed Memon, Soil Scientist will learn exchange experiences at Colorado State University, USA. The University of Utah is the partner university provides technical assistance for advancing the development and sustainability of the Center. Before this cohort, 68 students and 13 faculty members including 23 female visitors have availed the exchange scholarship opportunity so far.